A CCTV image of a man police wish to trace in connection with an attempted murder investigation in Edinburgh has been released. 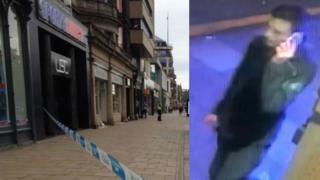 The attack happened at about 03:50 on Saturday on Princes Street, outside the Sports Direct store. A 32-year-old man was attacked and sustained injuries to his arms, torso and face. Detectives believe the man pictured can help with their inquiries and are urging anyone who recognises him to come forward. He is white, between 5ft 7in and 5ft 10in, of slim build with light-brown hair and a clean-shaven face. He was wearing a dark hooded top, dark trousers or jeans, dark Nike trainers with a white sole and white Nike emblem. Det Sgt Mark Lumsden, of Police Scotland, said: "This incident is now being treated as an attempted murder and I would ask anyone who can assist with our inquiries to come forward. "We're eager to trace the man pictured as we believe he could have important information relevant to the investigation. "I'd ask him, or anyone who recognises him, to come forward as soon as possible."